In recent years, democracies have struggled to respond to a host of internal and external challenges. 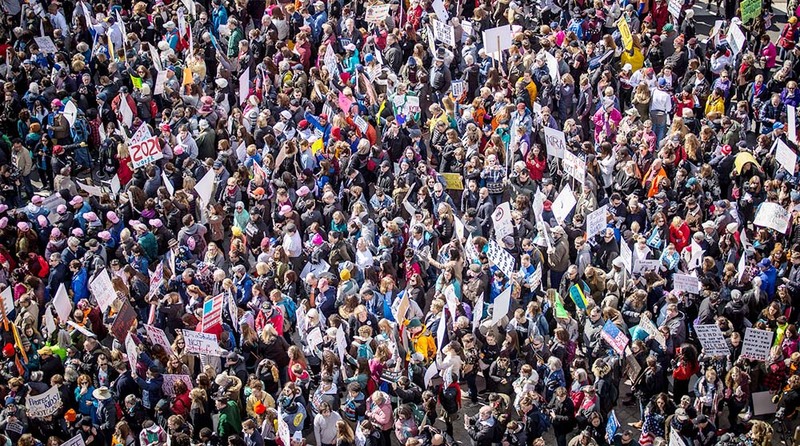 Two new studies put a spotlight on this development: one on the decline in the quality of democracy worldwide and another on the public perception of its performance. In the study State of the world 2017: Autocratization and Exclusion? published earlier this month by the academic journal Democratization, the authors analyze data provided by V-Dem project. They find that for the first time in almost forty years, autocratization has affected the same number of countries – 24 – as democratization. This downwards trend is even more dramatic when weighed by population. Instead of considering, for example, the positive developments in countries such as Burkina Faso and Gambia as having the same weight as the democratic backslide in the United States and India, the authors adjust for country size. They find that in 2017 2.5 billion people lived in countries that moved towards autocracy. The alarming conclusion is that the last six years alone have reversed 25 years of democratic advancement in the world. Autocratization has occurred through the erosion of the liberal components of democracy. While holding elections to pacify the population and the international community, autocrats have limited freedom of expression and association, as well as independence and power of the judiciary and the media to render these elections less and less meaningful. They create the illusion of political competition, while introducing subtle mechanisms of oppression and manipulation. The globally continuing improvement of the electoral components of democracy therefore is deceptive. The findings concerning the distribution of power among social groups and genders presented in the article is equally disheartening. Currently only 15% of the world’s population live in countries where men and women and people of different socioeconomic status have at least somewhat equal access to power. Worse, the trend is moving not away from, but towards inequality in power distributions, especially in populous countries such as the United States and India. The rich and the male are accumulating more and more power, and, too often, they use it to undermine liberal principles of democracy. The second study presents the results of the Democracy Perception Index 2018 that was conducted by Dalia Research in collaboration with the Alliance of Democracies Foundation and Rasmussen Global. The democratic backslide described before has not gone unnoticed by the populace as the results indicate. 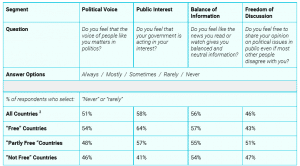 51% of the people who provided answers to the administered survey (a total of 125,000 across 50 countries) think their political voice does not matter, and 58% do not believe that their government acts in their interest. 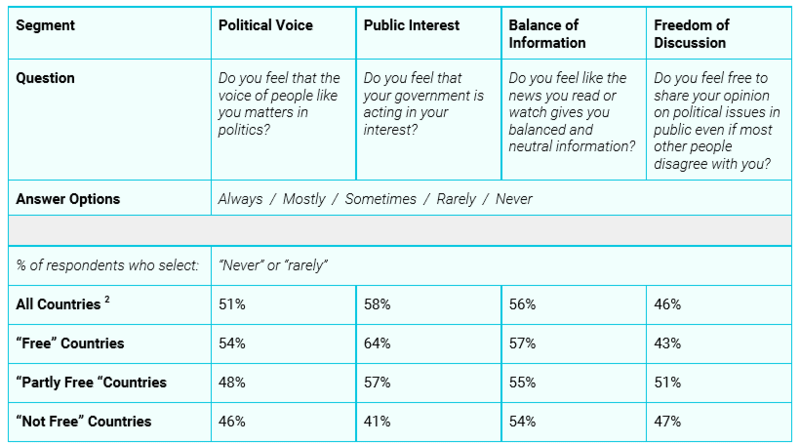 Further, 56% and 46% of respondents feel that the availability of reliable and balanced information and the freedom to express one’s political opinion respectively are severely limited in their country – two provisions without which a healthy democracy cannot exist. 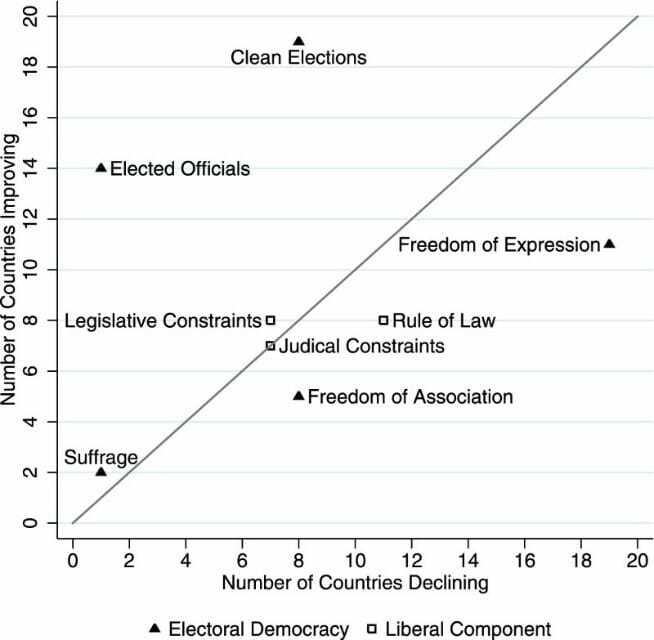 Strikingly, people living in democracies are even more discontent with their governments’ ability or willingness to ensure that the people’s political voice (54%) and their interests (64%) matter, than those living under authoritarian rule (48% and 57% respectively). In short, the public perception is that today’s democracies are neither a rule by, nor for the people. Together, the two studies paint a daunting picture of the state of democracy today. 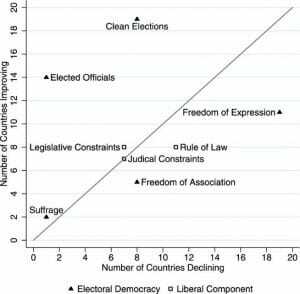 Many countries that had been thought to be stable democracies have seen the erosion of their liberal components, and their citizens have become more and more disillusioned with their governments’ ability to provide those benefits that should distinguish them from less free regime types. Marie completed her Bachelor's degree in Government at Harvard University in the United States and is now studying in the MA Euromasters Program for Contemporary European Studies at the University of Bath in England. She is a member of Democracy Without Borders.